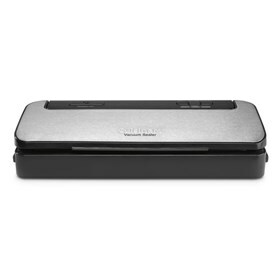 The Cuisinart VS-100 vacuum sealer helps to keep the favorite foods fresh for longer periods. The quick sealing feature allows packaging delicate items like fresh berries, fish, pastries and more. The other highlights include easy locking system, simple three-button operation, integrated drip tray and extra-wide sealing strip. The Vacuum Sealer has many exciting features for users of all types. You can extend the lifetime of your Vacuum Sealer with the purchase of a FactoryOutletStore Factory Protection Plan. The Vacuum Sealer is sold as a Brand New Unopened Item.